When I was younger my aunt used to always drop packages off at Christmastime filled with sorts of cookies. 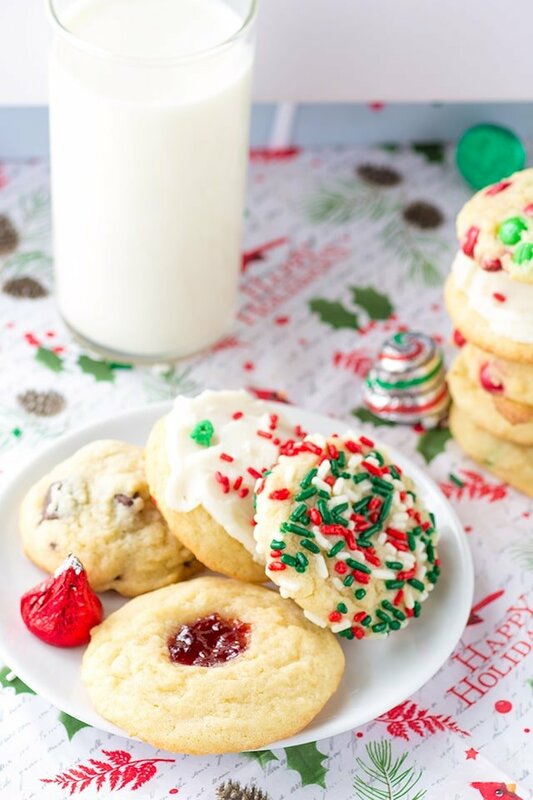 That inspired me to make this post for five Christmas cookies one dough. I made one basic cookie dough and added in several different things to make them a whole new cookie. It’s a great way to get creative and have a little fun too! All of the different cookies look so gorgeous in the gift box. This cookie dough tastes amazing too. It has a crispy bottom and a chewy top. They do spread some regardless of whether you chill it or not. 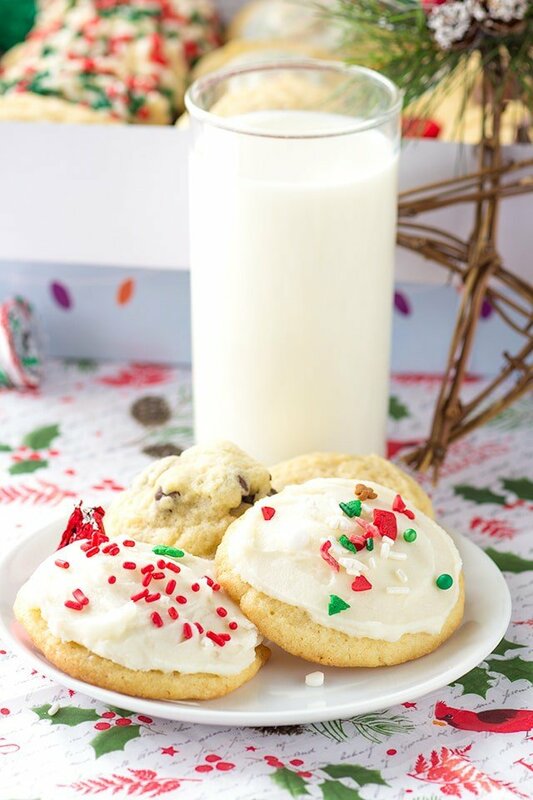 The cookies tend to be thicker with things in them like chocolate chips, candies, and sprinkles. They are slightly thinner if you make them into thumbprints, topped with a chocolate, or plain so you can frost them. 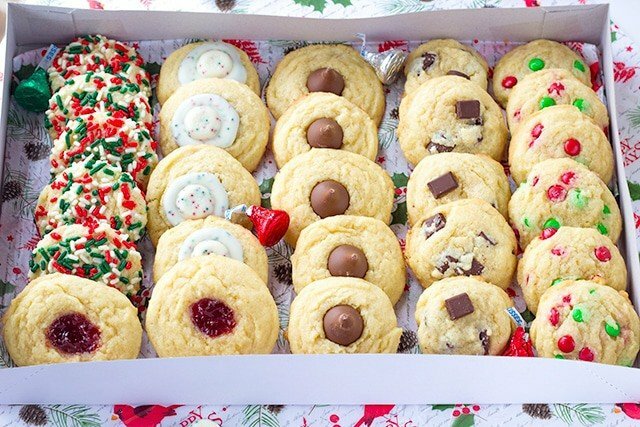 You know what makes the perfect gift boxes for a large box of tiny cookies? Those adorably decorated shirt boxes that you can find at the Dollar General. They might have them other places, but that’s my go-to place to pick them up. They are the perfect height and so affordable. There’s always festive tissue paper and raffia string there to fancy the packages up even more too. Plus if you tie the boxes up, you don’t have to worry about them coming apart while traveling. I sent a box of these down to my husband’s work yesterday. He came home and said as he was walking through the door that the guys were hammering them and he didn’t know if there were even any left. I had all intentions on asking him when he came through the door how the cookies went over, but he must have read my mind. I guess these sorts of things are bound to happen after spending over 11 years together. 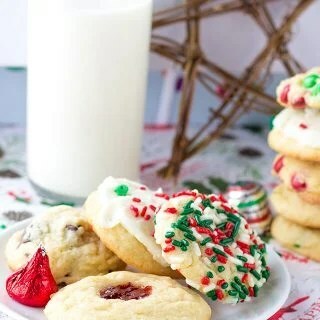 I think I’m going to whip up more cookies, if the candies last that long, for my friend Kirsty. They are always game for my baked goods and will dig my cookie boxes, I’m positive. She’s the creative type as well. One of the many things that I adore about her. 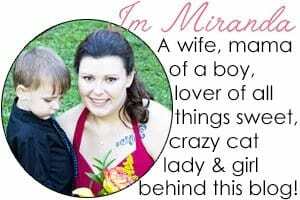 She also loves and adores my son, which is always a quick way to my heart. In a mixing bowl, add in the butter, shortening, and sugar. Mix on medium until light and fluffy. Add in the vanilla and the eggs one at a time until incorporated. Scrape down the sides and beat to combine any remaining egg mixture. Add in the flour, pudding mix, baking powder, and salt. Beat on medium until incorporated. Divide the cookies into 5 portions or more. 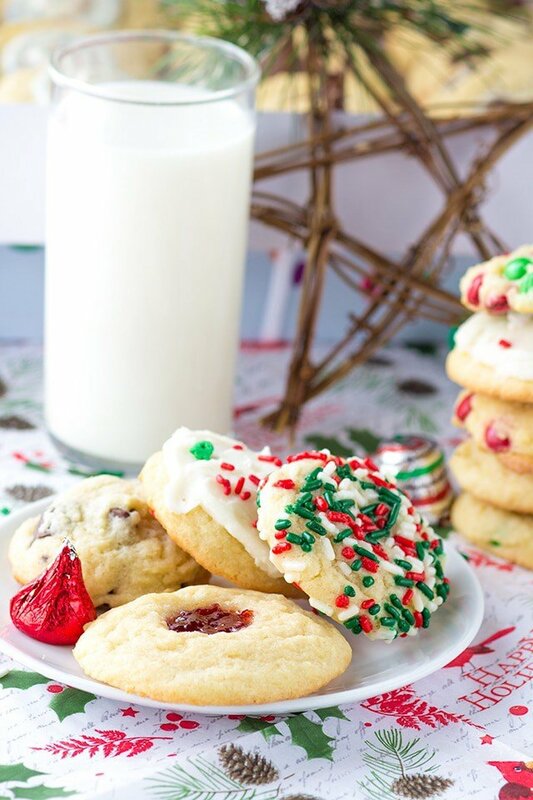 Each will be a different cookie. First dough, scoop using a small cookie scoop and roll in sprinkles. Second dough, scoop using a small cookie scoop, bake, and frost. Third dough, scoop out. Press your finger into the center of the cookie and form a nice hole to add jam in. Add in desired jam. I used strawberry. Fourth Dough, add in chocolate chips, white chips, m&m's, snicker bites for baking, cinnamon chips, whatever you prefer. Scoop and bake. Fifth Dough, scoop out and bake. Once baked, remove from the oven and let cool for 3 - 5 minutes. Place chocolate candies on top to decorate them. Place the scooped dough into the oven and bake for 10 minutes. Remove from the oven and let cool 10 minutes before placing on a piece of paper towel to cool. 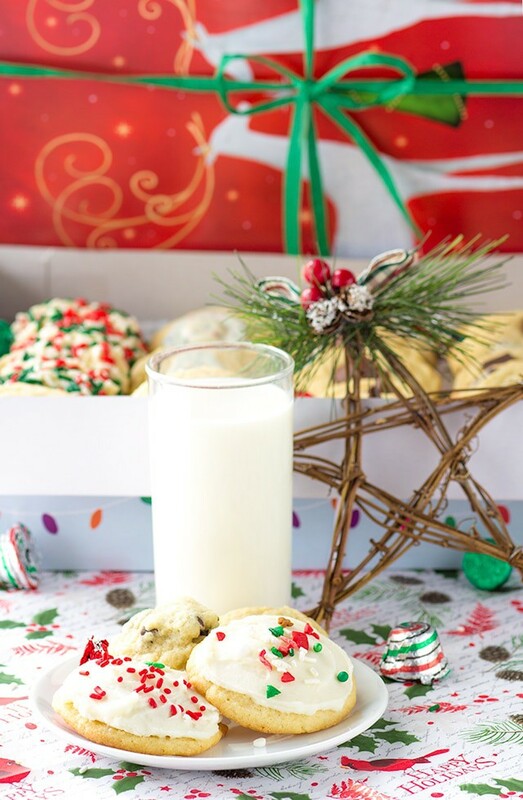 Wrap up in your homemade cookie boxes and send to your friends and family. 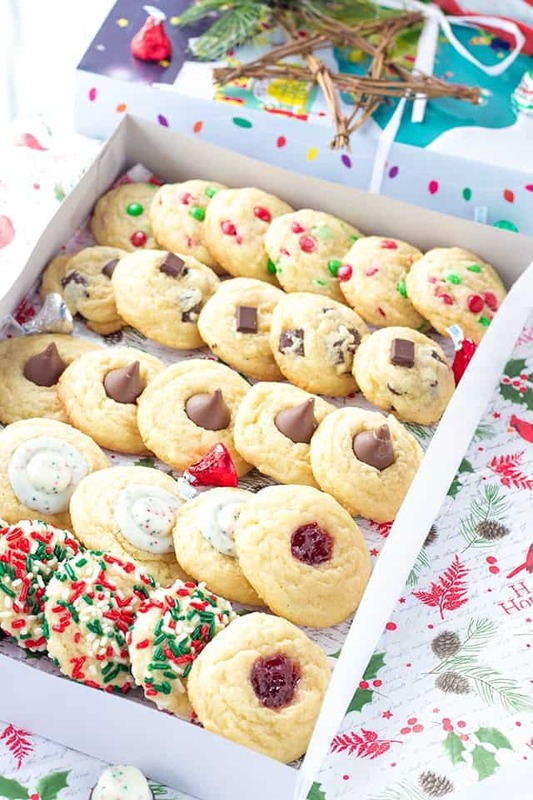 Christmas baking can get pretty stressful so this recipe is absolutely perfect – so many varieties with minimal effort! Love this! What brand of shortening did you use? Crisco or Tenderflake?